It may not come as a surprise to you, but Foxcatcher is not a cheery movie. Like, at all. So much so that it’s astonishing how it can be so stapled to the ground and how it can keep such a dour facial expression for over two hours. This is, however, the movie that we expected it to be, given that it is based off a tragic real-life event that leaves no room for joyful moments whatsoever; but we’d wager that few would anticipate how much of a cold, bleak film it turned out to be. This has been director Bennett Miller’s approach for a while now; with his Oscar-winning Capote, he conveyed both the flamboyant obsession of the famed writer and the real-life tragedy that inspired his book In Cold Blood with a darkened and manipulative nature, while in Moneyball the statistics that would later define how baseball is played at first end up having dire consequences for the people behind it, resulting in more of a personal loss rather than a professional one. 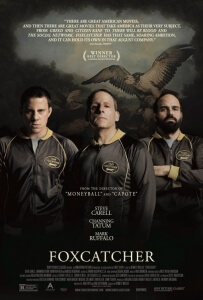 Foxcatcher is closer to Capote than Moneyball in its themes and overall tone, but Miller this time around has gone for broke in displaying the heartlessness of the situation and the characters involved. His direction is dialled back to the barest minimum, allowing for the visuals accompanied by Greig Fraser’s bleak cinematography to tell most of the story which is a welcome sign for anyone worried about the misuse of the visual medium. There is quietness even in heavy dialogue scenes, with pauses being so frequent between lines that you’d swear you were watching a Harold Pinter production. Miller’s subdued direction takes the story into a dark and uncomfortable territory visually, yet nothing can truly fix how hollow and empty the script can be. The main focus is on Channing Tatum’s Mark Schultz as we see him struggling to prove himself to the world – we first meet him as he’s preparing to give a flat and awkward speech to grade-school children, which only came about because his more popular older brother Dave (Mark Ruffalo) was unavailable – while also maintaining something of a connection with anyone who gives him attention. The problem is that Mark, as depicted in the film, is consistently bitter and private while keeping his true emotions to himself and pushing people away, therefore making it difficult for us as an audience to establish an emotional connection with him. This is a crucial problem, especially since Mark is effectively the lead here, because there is no further safety net for the film to fall back on when it comes to true emotion. The closest we get to real heart in the entire picture is Ruffalo’s nuanced portrayal of the caring and morally-balanced Dave, and even then those who know the real-life story will know just how that ends up. Arguably the most “showy” performance of the bunch is, of course, Steve Carell and his marvellous prosthetic nose (seriously, that make-up is pretty damn awesome) as multimillionaire John du Pont. It is unlike anything the actor, best known for his more comedic roles, has done before and he brings to life a very unsettling and disturbed character that despite a clear mental illness and lonely nature – at one point, he tells a story of how his elderly mother (Vanessa Redgrave) paid a young boy to act as his friend while growing up – never gains our sympathy due to his slimy and manipulative nature. The film, however, almost never touches on the real du Pont’s case of paranoid schizophrenia, which leads to the horrific events committed in real life and in the film, which makes the incident seem to come completely out of nowhere without the proper build-up. You could argue that the real incident was a case of premeditated crime as it is in the film, but the film is so loosely tied together that what he does and who he ends up doing it too doesn’t make much sense within the overall narrative. Nonetheless, Carell gives a marvellous and calculated performance that gives us the vaguest of hints within the mindset of this disturbed man. It’s doubtful that wider audiences will find themselves warming to this film, with the slow-burner pace and quiet direction being privy to test most people’s patience and potentially appear to be far too dull and overstretched to them; however, nobody should be at fault regardless if they go in and end up liking it all the same. Even as a critic, this reviewer is not entirely convinced that it will be among many critics’ favourites in the build-up to the awards season; though there are some areas of merit such as the acting and make-up, Foxcatcher is unlikely to sit with anyone looking for something more passionate or pleasurable. Instead, it’s a rather cold movie with only minor areas of warmth. There’s a lot to admire about Foxcatcher, from director Bennett Miller’s quiet and subdued direction to the eerie and almost nightmarish environment to, of course, three marvellous lead performances. However, its emptiness and cold, hollow nature leaves an unsatisfying taste that lingers in the taste buds long after it’s been swallowed, and it can potentially be a bore for the regular cinema-goer due to its emotional disconnection with its hard-to-like main characters and consistently sour tone.